Description It all started off with this very simple model made from matck sticks. At the time I just wanted to visually try and understand in 3D. It was very helpfull. Description Very simple prototype using jam jar lids (heavy outer rim) for gyroscopes and high rpm DC motors. It now seems a silly attempt, but at the time I hadn't see a gyroscope running and I had very little in the way of engineering knowledge. It was simply a case of switching the device on to see if there was any obvious lift. The device was too unstable to test for weight loss and I decided that it would be create something new and better designed. I do remember one of the jam jar coming off from the motor axle and for a very small mass it surpised me by the force the gyroscope/lid contained. Description Made from two 'toy' gyroscopes and motors from a vacuum cleaner and a old computer plotter. The whole device was hung from a pully system with a counter-weight on the other end. The counter-weight was then measured for weight changes. 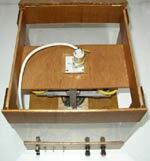 Measuring the direct weight of the device would have been almost impossable due to vibrations and sideways movements. Some parts were replaced during early tests because the gyroscopic forces 'folded' the ply-wood struture. This was later replaced with aluminum. The results are listed below. The results were inconclusive because of all the vibrations and possible air movement (even thou I tried to seal everything in). The center DC motor used to drive the gyroscopes overheated, probably because it was itself rotating in the centre structure (the armatures were going round at faster than they should have been). Description Made out of toy gyroscopes, pillar drill as motor (not shown), Balsa wood for struture. 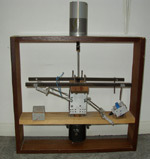 A slow speed test was carried out using the pillar drill but it broke one of the 'arms'. I decided that whole idea was to flimsy. Description This was started but never finished. I could have gone on and completed it but I now have access to pre-built (but smaller) gyroscopes. Building everything part-by-part takes a long time. Another reason for not finishing it is the fact that I want to go back to studying a single gyroscope. Hence this was never finished. Description 4 high speed gyroscopes running upto 29,000rpm~ The gyroscopes are hinged, but with a lock to stop them moving beyond a fixed angle. The whole structure is rotated while the gyroscopes are spinning. The device simply failed to produce any significant propulsion force. I even tried running the gyros anti-clockwise with the structure running clockwise (still pushes the gyros inwards). 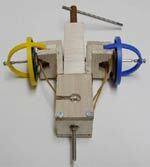 The gyroscopes ended up weighing 80g each with the whole device weighing 2815g including all motors but without power supplies. As far as the build quality of the device is concerned this is in many ways the best I've made so far. 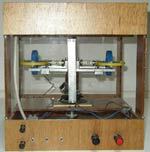 The gyroscopes run smoothly when the whole structure is moving or still, with little vibration. They are also better aligned with one another. The device did change weight at points to 2810g and 2820g but this change was for only short periods of time and could be produced by the quite large air movements of the gyros. The changes also went up as well as down which is not good news. Description This prototype is loosely related to prototype 5 but this one was finished (pictures show it taken apart). It was flawed in its concept so did not work. The outcome of this prototype has made me go back to studying single gyroscope configurations. You can fill in the form on the home page and I will let you know when this page is updated.